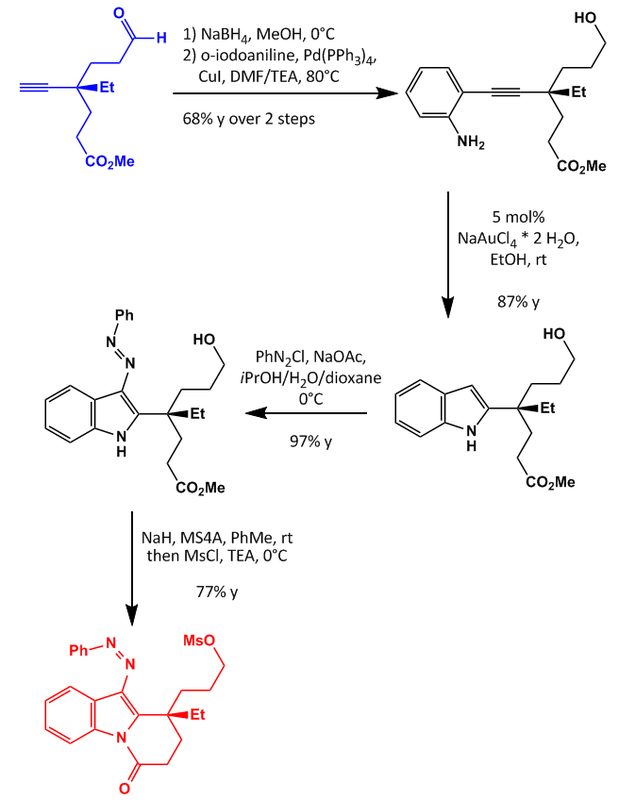 This time I will present to you a very short synthesis from the Fukuyama group which took only about 12 steps from cyclohexanone to the product. No special biological profile or so was mentioned but the need for a stereoselective total synthesis drove the group on. 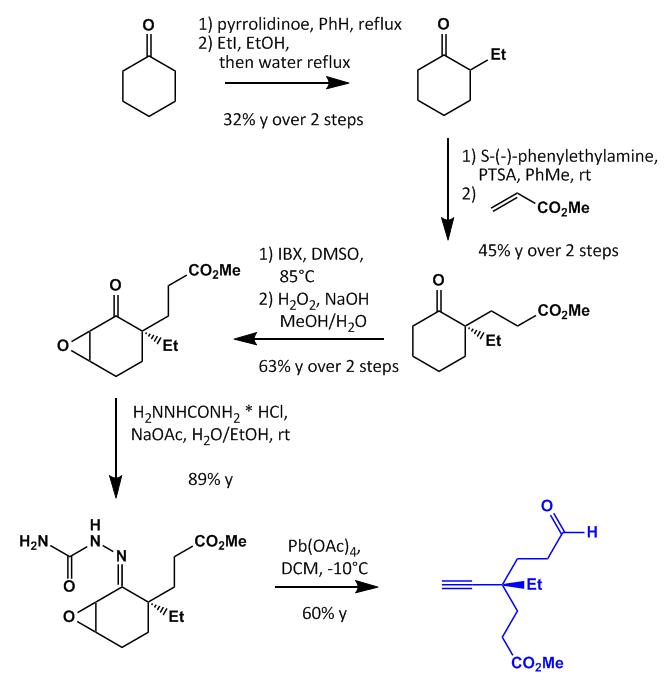 Key steps are a Eschenmoser-Tanabe fragmentation and an accidentally found cyclization/oxidation reaction. I will not go into detail with the retro because it will be explained in the next 3 schemes but I present it for the sake of completeness. Starting from cheap cyclohexanone forming an imine which was alkylated then changed into a chiral imine with phenylethylamine which in turn undergoes an asymmetric addition on methyl acrylate. 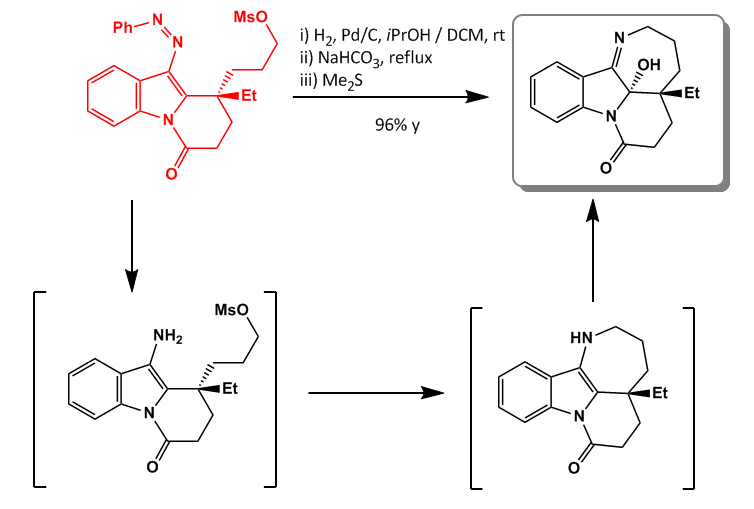 Oxidation with IBX in DMSO was followed by epoxidation with aqueous peroxide yielding the intermediate ready for the Eschenmoser-Tanabe fragmentation. This posed some problems to the authors but could be solved first by using a semicarbazide which was oxidized secondly with LTA to give the blue intermediate shown. Aldehyde reduction and Sonogashira coupling of the alkyne was followed by a nice gold catalyzed indole formation. Diazo coupling with phenyldiazonium chloride yields the azo bridged indole which cyclized with the ester after deprotonation with NaH. Subsequent in situ mesylation of the alcohol furnished the last intermediate ready for the key step. After several attempts to optimize the conditions, this high yielding one pot procedure was developed giving Mersicarpine in almost quantitative yield. 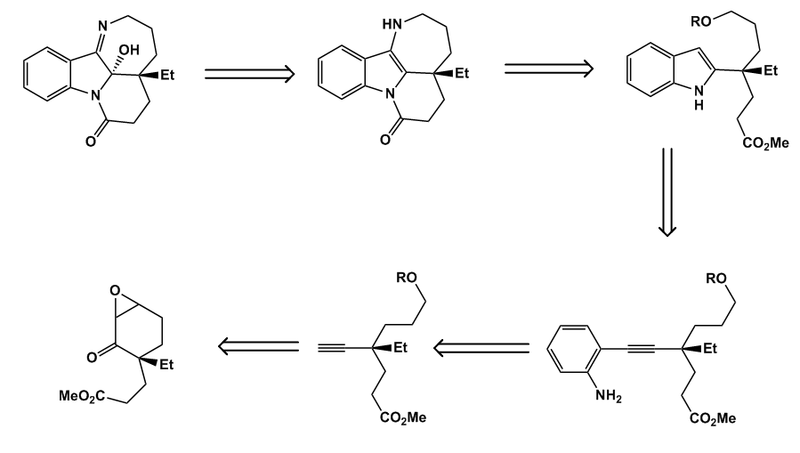 The first step is the reduction of the azo bridge to the aminoindole. This undergoes a SN2 displacement of the mesylate forming the last ring needed. After tautomerization an autoxidation occurred which formed a hydroperoxide which was reduced with dimethylsulfide to yield the natural product. Again I’m very busy but maybe I manage to review the incredible paper from the Fürstner group which came up last year.